Does your business involve the renovation, repair or painting of structures built before 1978? If so, there are new federal regulations that took effect April 22, 2010 which may prevent you from performing your work. Under the United States Environmental Protection Agencies Lead-Based Paint Renovation, Repair, and Painting (RRP) Program, construction firms must apply for and receive EPA Certification to disturb paint as part of their work in pre-1978 housing and child-occupied facilities. In addition, all of these jobs must be supervised by Certified Renovators; specifically, individuals who have completed an EPA-accredited, full-day training course. 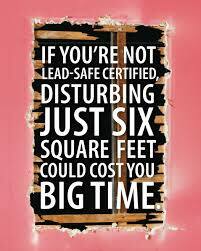 The training course is required for any contractor that is involved in any activity that will - or has the potential to - disturb six square feet of lead-based paint in a room or 20 square feet on the exterior. The rule does not apply to minor maintenance or repair activities; however window replacement is not considered minor maintenance or repair. Anyone disturbing more than 6 sq. ft. (interior) & 20 sq. ft. (exterior) of lead paint.